Keyboard tray is for demonstration only. Please order your keyboard tray separately. The Pinnacle AD Value is Workrite’s arm with the greatest range. It includes thoughtful features found in our Pinnacle family, like Lift-n-Lock for re-positioning and easy tilt adjustment with a built in tilt gauge. Ideal for situations where above desk keyboard platform is desired and stowing the platform under desk is convenient. The Pinnacle AD features our greatest height range of 14½", 7½" above work surface and 7" below. At 7" below, the Pinnacle AD meets the seated low requirement of BIFMA G-1 2002 for the 5th percentile adult female and exceeds the seated requirement for the 95th percentile adult male. In addition the Pinnacle AD’s extended above desk height range gives the majority of users the ability to work in standing positions. The unique design of the Pinnacle AD Value gives the best keyboard platform storage available in the industry, fully storing a platform as deep as 11½" under the work surface on a 22" track. The Pinnacle AD Value features a full 25˚ range tilt based on the ANSI BIFMA G-1 2002 Ergonomics specifications of 10˚ positive tilt and 15˚ negative tilt. Our convenient tilt gauge at the rear of the arm allows users to identify the comfortable tilt angle and easily set the tilt to their preferred position with our dial-tilt knob located on the right side of the arm. The Pinnacle AD Value uses our high quality low profile progressive ball bearing track for ease of use and years of trouble free service. 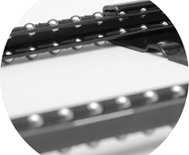 Available in 17", 22" and 28" lengths the Pinnacle AD Value installs easily on all popular workstation depths. Also offered with a nylon track for budget conscious projects. 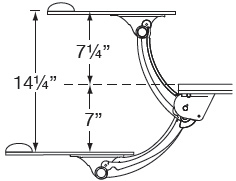 Step 2 : Track Length ..16 13/16" track length for desks deeper than 17"
Allows keyboard and mouse platform to pivot an extra 45° for special mounting requirements. 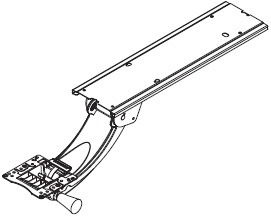 Mounts between the arm and keyboard platform. Required only when the edge is thicker than the rest of the worksuface. Available in 16" and 21" lengths (please specify). Dimensions: 12" W x 1 3/4" H.
Adjusts to fit 1" to 2" thick work surfaces. Converts 90 degree to useable work area. a = 17.5" ... b = 9.25" ... c = 1.5"
Move operator closer to work surface. Designed specifically to fit model # 321 with Pinnacle 2 Arm. Also work with the following platform models: 187,188,487,488. 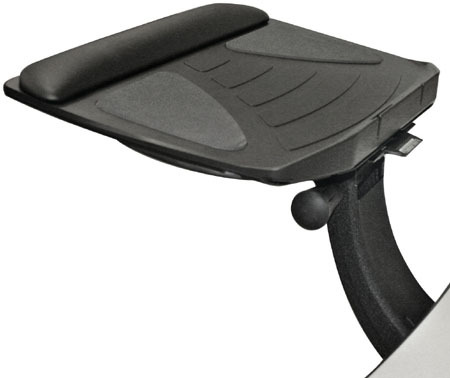 Converts 90 degree corners and diagonal corners less than 17" to useable work area. a = 26" ... b =15" ... c = 1 1/2". Fits all platforms up to 28" wide. Works with all WorkRite keyboard arms. Converts 90" corners and corners with keyboard cutouts to useable diagonal area. Workrite warrants to the original purchaser that the products it manufactures are free from defects in design, material and workmanship. Subject to the limitations below, Workrite warrants each product in this catalog to be free from defects in materials and workmanship for the life of the product in its original installation. With prompt written notice, Workrite will repair or replace, free of charge, any product, part or component which fails under normal use as a result of such defect. Electric components, motors, frames, brackets and feet.